France’s presence in the World Cup final isn’t a huge surprise. While Brazil and Spain were the pre-tournament favourites, France were still given a 16 per cent chance of making the final. And as other faltered, Didier Deschamps and his young team strode on. Croatia, however, were always major outsiders. Their results haven’t always reflected the talent in their team, and they were given just a five per cent chance of reaching the final by our statistical model. In fact, a second round exit to France was seen as the most likely outcome, but after topping their group ahead of Argentina and landing themselves in a favourable half of the draw, their odds of playing on the final on Sunday rose to ten per cent before the knockouts. Despite their impressive run, Croatia remain the underdogs in Moscow. At 21st Club, we use a combination of a models to predict the likely outcome. The first model relies solely on team results, weighted towards more recent performances. This model captures the impact of coaching and cohesion, and gives a strong baseline indicator on the quality of a team. It makes France healthy favourites with a 59 per cent chance of victory, and a 42 per cent chance of completing the win in normal time. The second model evaluates the quality of the players on both teams. This model captures the nuances of team selection, which can vary significantly in international football. France have a supremely talented squad and therefore a bigger edge here; they have a 65 per cent chance (50 per cent in normal time) according to our player model. Averaging these two models gives us our final prediction of 62 to 38 in favour of France. Other factors come into assessing the two teams’ chances, though quantifying them can in some cases be easier said than done. France’s manager Didier Deschamps has at times been criticised for his team’s pragmatic playing style. France have as much attacking talent as any team in the tournament, but Deschamps signalled his intentions from game one by picking full backs Benjamin Pavard and Lucas Hernández over the more offensively-minded Benjamin Mendy and Djibril Sidibié. Against Croatia, picking Mendy and Sidibié would increase France’s chance of conceding a goal by three percentage points, but also increase their chance of scoring by four percentage points, a net gain. Deschamps, however, is very unlikely to change a winning team, especially after defending so resolutely against Belgium. Croatia are also unlikely to alter the team that beat England, but there are concerns that their players will be fatigued after three back-to-back matches that went to extra time (and two that went to penalties). But as previously observed, national teams that have endured multiple extra time periods have historically won their next game as often as they have lost. If anything, Croatia looked stronger and less fatigued than England during the last hour of their semi final. The other question concerns Croatia’s pedigree. They haven’t actually won a tournament knockout match in 90 minutes since 1998. The last national team to reach a World Cup final having never previously played a major tournament final was the Netherlands in 1974 – but even then their squad was full of players who had played a key role in Dutch clubs’ phenomenal success in the European Cup between 1970 and 1973. Dejan Lovren, Ivan Rakitić, Luka Modrić and Mario Mandžukić have all played in Champions League finals, but are two, four, six and seven years past peak age for their positions. The average player in Croatia’s likely starting 11 is three years past peak age, whereas the average French player is exactly at peak age. That difference is usually worth four percentage points in win probability alone, before you account for the difference in talent levels between the teams. The betting markets seem to have accounted for these additional factors and tipped the balance further in favour of France. According to the Betfair Exchange, France have an implied 67 per cent chance of winning the World Cup (51 per cent chance in normal time). 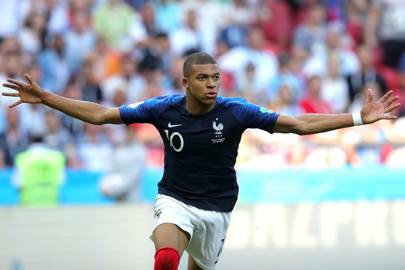 But it’s been a tournament of fine margins; our models gave France just a 19 per cent chance of reaching the quarter finals when trailing Argentina 2-1 in the second round, and Croatia’s chances of reaching the final fell to just nine per cent when losing 1-0 to England. Both teams were very nearly not here. The odds of a normal time draw or one-goal win are 69 per cent, and in circumstances like those it’s often best to ignore the odds and simply enjoy the tension.